I know, I know—if I’d? just stopped to glance? at the title even once while writing my last post, I would’ve remembered? what the heck I was supposed to writing about? .? But that would have required (a miniscule amount of)? thinking.? Which, by the end of the day, is not my strong point.? Besides, my brain likes to hibernate at night (which is how I excuse my reality show habit).? You know, bears should really think about wintering on chocolate truffle cake—it sure does the trick for me. 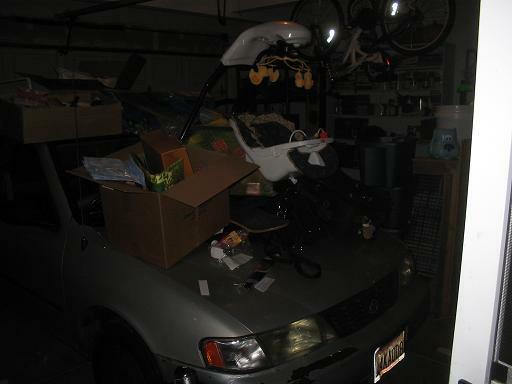 So, finally, on to the intended subject of my last post—-our 3-car garage? (afer all that build-up, this is destined to be anti-climactic).? When we bought this house, there were two things I really, really craved—a huge walk-in closet, and a bigger kitchen.? There were also two things my husband wanted—a big yard and a 3-car garage. 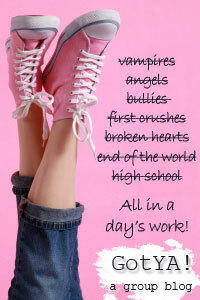 Somehow, yours truly? ended up? the big stinkin’ loser of that round.? Prior to moving, I wasn’t even aware it was possible to trade up to a bigger house while trading down in kitchen space.? And the walk-in?? Well, I can ambulate into it, so I suppose it qualifies.? What I really wanted, though,? was one of those gi-normous ones I could? throw a decent-sized party in, if I so desired.? Unfortunately, unless I’m planning a fiesta for two very, very intimate friends, it ain’t happening.? So, my husband ends up with a bigger yard (for which we have to out-source the upkeep) and a 3-car garage. Personally, I think the larger garage was a really bad idea.? My theory?? Well, it’s? based on purses.? See, if you are a purse-stuffer, like myself, then you know it’s best to carry a tiny purse.? Why?? Because no matter what size purse you carry, it will soon be filled to the brim, and then some, with a plethora of crap.? And the rules of physics and basic anatomy dictate that a smaller crap-stuffed purse is much lighter and easier to manage than a larger crap-stuffed purse. This same rule applies to garages.? 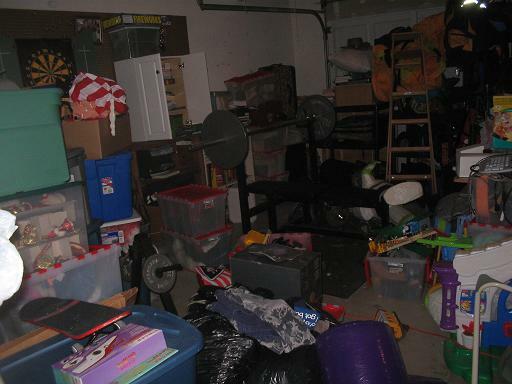 When you are a horrible unorganized pack-rat, it makes sense to err on the side of a smaller crap-stuffing space.? ? Don’t believe me?? Well, I’m pretty sure a quick gander at our garage is all the convincing you’ll need. The funniest part?? 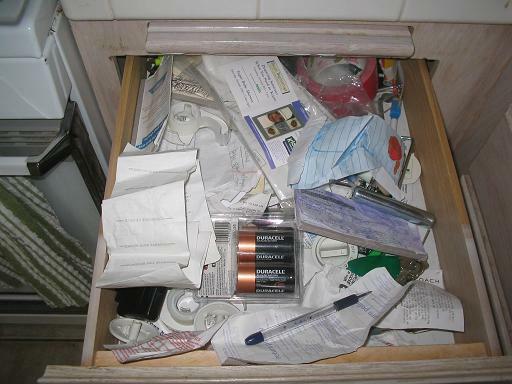 My husband likes to give me grief about what he calls “the wife drawer” in the kitchen, because it’s so messy.? But the garage is his domain. By the way, some of the bins on the left?? Those are the clothes that don’t fit in my new closet. Paybacks work in mysterious ways. I think you need to try for HGTV Mission Organization. It sure couldn’t hurt!!!!! 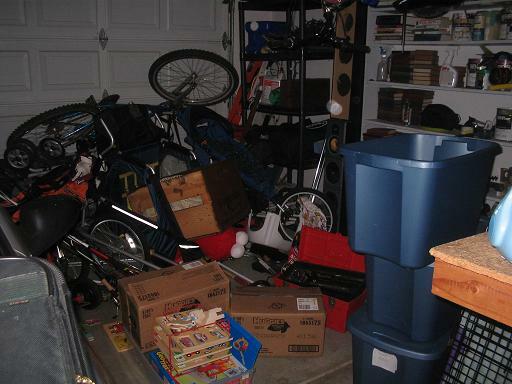 Our garage kind of looked like this except the junk was piled to the cealing. We finally got it cleaned up when the HOA complained and threatened to fine us for it. 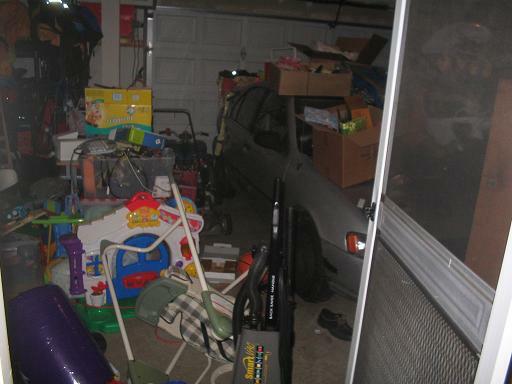 We don’t have a garage, but that looks precisely like our utility/laundry room (minus the car, of course). I briefly considered including it on the house tour, but I can’t bear looking at it long enough to photograph it.